The South West Blues Club Inc. in Bunbury W.A. 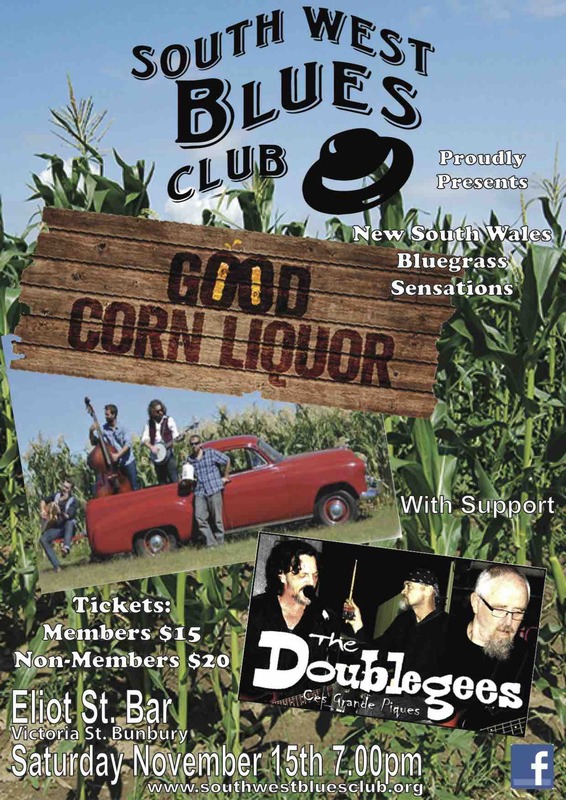 have announced that they are featuring a Bluegrass band called Good Corn Liquor from New South Wales. This group will be playing at their regular club gathering on Saturday 15th November. Organisers say that this is the first time that they have had a Bluegrass Band at their club and are seeking to attract new audiences to their club nights. Good Corn Liquor is a country/bluegrass inspired band hailing from Gunnedah NSW. Currently residing in Newcastle, NSW they can be regularly found playing shows around the Hunter and North West. Covering a multitude of artists from Soggy Bottom Boys, Old Crow Medicine Show all the way through to bands such as Aerosmith and The White Stripes. They love a beer and a knock about tune, with a current repertoire of originals shining with country, blues and bluegrass influence.